Comic book writer J. Torris (Bigfoot Boy, Jinx) gave a copy of War Brothers (the novel) to artist Daniel Lafrance. Dan was inspired enough to make a few sketches. He then drew ten pages of sequential art to include in a proposal. Holding my breath, I showed them to Rick Wilks, Director of Annick Press. Here’s where I say, “and the rest is history.” But wait! I had a huge learning curve ahead of me. Dan had to carry me like a sack of potatoes. Yes, the words in the book are mine, but it was Dan who figured out how to transform them into a meaningful and powerful graphic form. Initially, I was worried about the level of violence in the story. Make no mistake, there is NO gratuitous or unjustified violence in this book. It’s all real and happening right now. It’s not possible to write about child soldiers without showing the brutality, and reminding the reader that these children are both perpetrators and victims. That said, there is a great deal of cutting edge material coming into the YA market. Many YA writers are trying to present difficult topics in ways that will expand young readers’ horizons: Deborah Ellis (I am a Taxi); Eric Walters (Shattered); Judie Oron (Cry of the Giraffe); Mariko Tamaki (Skim). The list is huge and growing. But what makes a great graphic novel? Passion and pacing. My collaboration with Daniel can be described as: I do what he says. I was astonished at Dan’s almost immediate perceptions and undeniable empathy with the characters. The novel War Brothers was the hardest book I had written to date (and then came Enemy Territory). I am a white, middle-aged, middle class, Canadian woman writing about a child soldier in Africa. I travelled to Uganda. 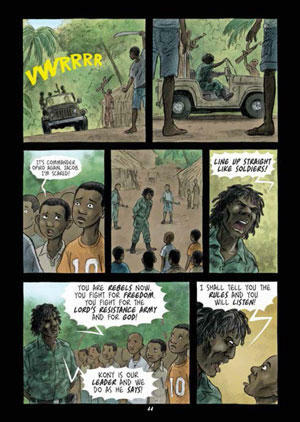 I interviewed many child soldiers, including a former First Lieutenant under the command of Kony, leader of the infamous Lord’s Resistance Army. I worked with Ugandans here and in Uganda. I listened. I rewrote. Adrian Bradbury (co-founder of GuluWalk, an initiative to highlight the plight of children in northern Uganda who are in constant danger of being kidnapped) was one of many early readers. I took nothing for granted. Dan did not go through that process and yet, he nailed it. He is truly amazing. As a form, the novel works internally. We hear the story in our heads. A narrative dances on a taut thread. The novel allows us to travel on the thread and meet characters, hear sounds and sights as we progress. That’s not to say that reading a novel is a gentle walk in the park. 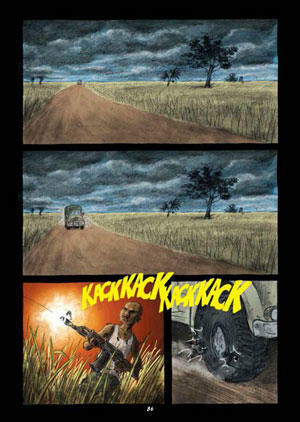 But the graphic novel is ‘narrative meets art.’ Bang! We experience sights, sounds and story, all at the same time. There is a lot to process. The pacing of the story becomes all important if we are to interpret what we are seeing, reading, and feeling. I am grateful that I have had the opportunity to work in both art forms, and plan to continue doing so. On the upside, visual kids have found a medium that really works for them. To the comic book snobs—two words: Classic Comics. How great were they? Unlike some, I don’t see the graphic novel as being in competition with the novel. It is simply another form of communication, no different than radio, television, movies, music, etc. The graphic story, or visual sequential art, is a very old medium (pre-Columbian, or closer to home, The Bayeux Tapestry, aka the Norman Conquest). The graphic novel has been waiting in the wings for some time—and now, it has finally arrived. I think my 2010 novel Thunder Over Kandahar (set in Afghanistan) has the drama and the scope that would make a great graphic novel. Dan and I are working on a huge project now that may take years. But my expectation is that Dan will soon be whisked away to New York or Hollywood. I am trying to keep him down on the farm for at least one more book. In 2009 Sharon McKay was named as a Canadian War Artist, the first young adult writer to hold the title. This venerable institution that hearkens back to WWI includes Alex Sorrell, George Plante, A.R. Thompson, Arthur Lismer, and Alex Colville. War artists may or may not support the action, but historically they support the soldier. Sharon’s trip to Afghanistan in 2009 (KAF and Bazaar-E-Panjwayi, Kandahar Province, on the Pakistan border) inspired her to write Thunder over Kandahar (2010). She writes outside her level of comfort, and often chooses areas of the world that are hard to reach. 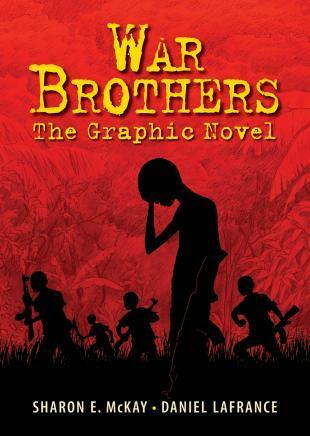 War Brothers is the story of child soldiers in northern Uganda. To write that story she went to Gulu, Uganda, and interviewed child soldiers. 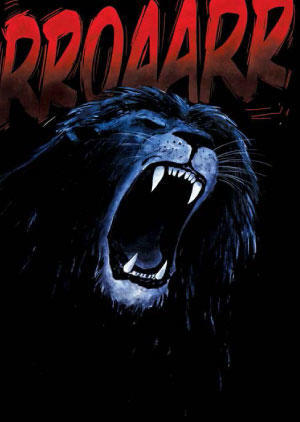 First published as a novel, it is now available as a graphic novel with striking art by Daniel Lafrance (Spring 2013).